My name is Raven. I live in Sydney’s North West with my husband and my 2 younger daughters aged 23 and 20. Two of our older daughters have recently left home to start families of their own. I became a proud grandparent in January 2004 and again in May 2005. I started my working career as a nurse and went on to qualify as a midwife and am currently working as a registered doula. I am committed to continuity of care, building a close relationship and supporting parents in hospital and in the home. 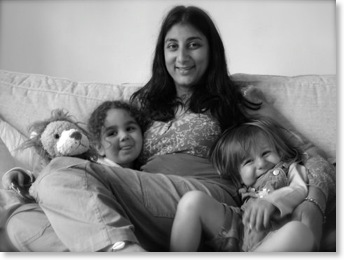 I have always been passionate and enthusiastic about the holistic approach to birth and the well-being of children. I believe that the emotions of labour and birth strongly influence the outcome. Empowering women to have faith and trust in their own bodies can help considerably towards a deeply spiritual, joyful, non-medical experience. I look forward to sharing the very special journey of birth with you.